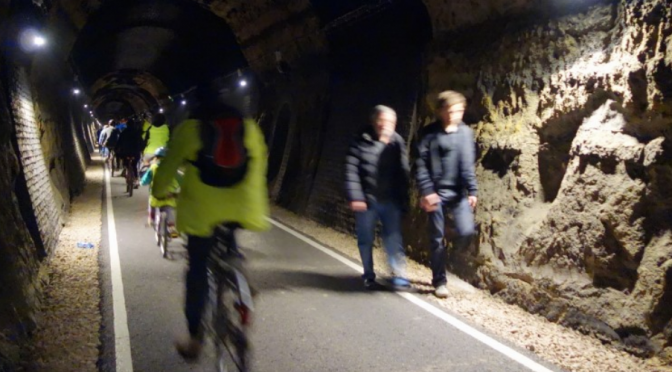 For those who missed this on previous occasions (or want to have another go…), Graham Burgess will be leading the popular Two Tunnels ride again. The full 48 mile route will start from Wharf Road Carpark in Devizes, meeting at 9:15 for a 9:30 (sharp!) departure. The route follows the canal towpath down past Caen Locks and continues through Semington and Staverton to Bradford on Avon where we will meet anyone opting for the shorter 23 mile route at the Lock Inn Cafe at around 10:45 for an 11:00 (ish) departure, so time for a quick coffee and cake! The route then continues along the canal path past Avoncliff and the amazing aquaduct through to Brassknocker Basin. From Brassknocker, it picks up the Sustrans 13 mile Two Tunnels loop which continues along the canal past Claverton, Bathampton and Bathwick before passing through the suburbs and into Bath centre. The route then follows the River Avon for a short while before picking up the gentle uphill gradient path through to the Two Tunnels which are an impressive 800 metres and 1672 metres long. From the Tunnels, the route goes over the Tucking Mill Viaduct to Midford where we will stop for a pub lunch at the Hope and Anchor (or depending on group consensus we can stop at Brassknocker cafe a couple of miles on – or both…). The route then takes to single country lanes for a mile or two with a couple of short, sharp climbs through to Monkton Combe where it drops back down to Brassknocker Basin to rejoin the canal path for the return route back to Bradford on Avon and onto Devizes with the gradual but long climb up past Caen locks to finish back at the Wharf Road carpark. This is an entirely non-technical route that will be at a moderate pace and suitable for anyone looking to add a few miles to their repertoire without the fear of big hills or scary bits. There are lots of opportunities along the way for cafe/pub stops and emphasis is on having fun and social day out doing something a bit different. No-one will be left behind. Parking fees (last time we did the ride there) were £5.20 at Devizes and £4.00 at Bradford on Avon – these may have gone up so have plenty of change. It is anticipated that the canal path will be reasonably busy with other cyclists and walkers so a bell would be useful if you have one. The tunnels are lit and well surfaced but is advisable (although not essential) to have a small commuter light for this section. Bring food/drinks, spares, a fully working bike and pocket money! Hmmm sounds like a job for my hard tail v brake bike……. Terrain/Difficulty: Mostly along flat cycle paths. Shops/Pubs/Cafes: Plenty of options along the way.